At the CWA District 9 Leadership Conference this week in Oakland, Calif., CWA President Chris Shelton rallied CWAers to channel the energy from the 2018 Midterm Elections into passing pro-worker legislation, successfully organizing and growing our union, and winning in 2020. Recognizing last year's incredible electoral successes across D9, including picking up congressional seats for pro-worker candidates across the district, Shelton talked about the importance of continuing the same tireless work to deliver concrete results for working families. "We need to take the incredible momentum from November and turn it into even more positive change – to enact policies that will create good jobs, raise wages, make it easier to join a union, and erase big money from politics," Shelton said. 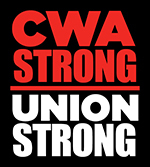 Shelton commended CWA Local 9415 for increasing their AT&T Mobility membership rate to over 90 percent, CWA Local 9510 for pushing its AT&T Mobility membership rate to 95%, UPTE-CWA Local 9119 for adding almost 1,000 new members since the start of CWA STRONG, CWA Local 9509 for their outstanding work on maximizing contributions to CWA's Political Action Fund (PAF), and the staff of the Los Angeles Times for successfully forming a union despite pressure from a vulture fund Wall Street owner and inspiring other Tribune-owned papers to organize with NewsGuild-CWA. CWA Secretary-Treasurer Sara Steffens, CWA District 9 Vice President Thomas Runnion, AFA-CWA International President Sara Nelson, Public Sector Vice President Brooks Sunkett, NewsGuild-CWA President Bernie Lunzer, and Oakland Mayor Libby Schaaf also attended the conference. At the District 9 Leadership Conference this week in Oakland, Calif., CWA President Chris Shelton (left) rallied CWAers to channel the energy from the 2018 Midterm Elections into passing pro-worker legislation, successfully organizing and growing our union, and winning in 2020.